Invite your customers to celebrate with you with margarita die cut postcards. These fun die cuts measure 5.5" x 8.5" finished and can be sent through the mail or distributed by hand. They come with a perforated margarita glass that can be used as a coupon or an entry ticket to your special event. Print die cut cards in color on both sides, then choose between a high gloss UV coating and matte finish to complete the look. 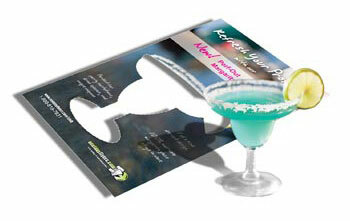 Margarita cards can be used for Cinco de Mayo marketing, to promote events, or as invites for birthdays and parties. Margarita die cut postcards are 5.5" x 8.5"
The perforated margarita pops out of the postcard and can be used as a coupon or entry ticket. For ideas on how to design your card, browse through our template gallery. If you see a design you like, you can click on it and the design will open in our online design center. You can type in your customizations and use it to place your order. Although margarita cards are great for Cinco de Mayo promotions, there are many other ways to use them, too. Reach out to the Latino community in your area with a targeted mailing. The Latino population is growing all over the U.S., not just in metropolitan areas or the Southwest. You may be surprised at how many new customers you can bring in by focusing on the Hispanic market.